Hands Up ! Who remembers the film 'Four Weddings A Funeral'? As a band, they are at the top level of Scottish Country Dance bands, having let their music take them to several points on the globe where proper Scottish dance music is sought and appreciated. The line-up can vary,depending on actual availability, including fiddle, accordion ,keyboards ,drums or bass. Details will be confirmed upon enquiry. Their musicianship is well known within the Scottish dance fraternity and they are always in popular demand - we cannot emphasize just how busy they become,months and months in advance. Every particular date/event/location will be individually quoted. For specialist Scottish dance nights or balls,the full band can provide the music to suit your programme, working either with their own MC (caller) or with whomsoever the client wishes to appoint as MC (details and programme arrangement by prior consent to the date). 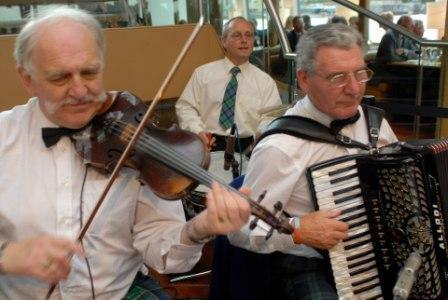 However,if your wish is for a top-notch Scottish band for your ceilidh where the standards of dancing are not quite so exacting,the ceilidh band will gladly provide a suitable caller to guide you and your guests through the Scottish 'favourites' up to the 'Eightsome Reel' level. Whatever, you will be in expert hands. Listen to the music files for the band - OR you could always hire a dvd of 'Four Weddings. What a wonderful performance you all gave for Will's 21st party - all our guests had a brilliant time and were just so enthusiastic about the music and the dancing. Thank you all so very much it made for the most wonderful evening which will remain in the memories of all of the participants for a long time. Please will you pass on our appreciation to all the members of the band. Your caller was fantastic and was able to judge perfectly how to get the non-reelers to a point where they could all join in and have fun. My brother-in-law, Nick, who does a lot of Scottish dancing, was so very impressed.Your caller had this ability to communicate what and how to do it, so please extend on our behalf our most grateful thanks. One of my special memories (apart from seeing so many of Will's friends joining in) was seeing my 89-year-old mother dancing Hamilton House. She was thrilled as she has always been an enthusiastic reeler but has not had much opportunity for the last 5 or so years to participate.